Originally titled Frontieres de la Poesie (1935), this book by Jacques Maritain, whose philosophical writings read as interestingly as a novel, will be welcomed by all who are seeking a better understanding of the art of our time. 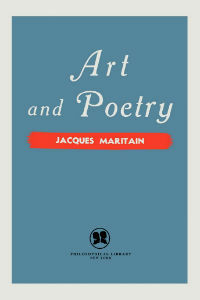 The book delves into Maritain’s thoughts on the nature and subjectivity of art and poetry. As a philosopher, Maritain attempts to define the two concepts, describing art and poetry as “virtues,” and as primarily concerned with beauty. Rather than focus on aesthetic theory, Maritain examines the concepts at a more tangible level, including a discussion of how they are made. The principles established with such precision and brilliance in his earlier work, Art and Scholasticism, which has had such a deep influence on contemporary artists, are successfully put to the test in illuminating the creative works of such diverse artists as Rouault, Marc Chagall, Gino Sevirini, and Arthur Lourie.